You may have heard from your doctor or a TV ad that fibromyalgia is caused by over-activity of pain sensing nerves. It’s true, this is one important source of fibromyalgia pain, but there are other even more important triggers of pain that must be addressed in order to get significant pain reduction. And unfortunately your doctor may not be aware of them. Many studies have shown that the fibromyalgia nervous system has become sensitized and therefore has overactive responses resulting in pain. This is the target of the three FDA approved medications for this illness, and these medications can indeed be helpful—usually resulting in about 30 percent reduction of pain. In my experience, both as someone with the illness personally and as a physician treating fibromyalgia, utilizing these medications alone is inadequate. For me, I didn’t find any relief from that deep, burning ache in my neck and upper back muscles until I found a treatment that addressed my pain in a different way. It turns out there is another huge factor that may be the missing piece of the pain puzzle. The massive connective tissue network that surrounds all of our muscles—think of the shiny outer coating on a raw chicken breast—plays a key role in generating the pain and muscle tenderness of fibromyalgia. In order to get more effective pain relief, both patients and providers need to understand exactly how this connective tissue (also called fascia) contributes to fibromyalgia pain, and use this information to target treatment. You can feel your own fascia right now if you gently bend your head to the side, as if trying to rest your ear on your shoulder. You will feel a pulling or stretching sensation on the opposite side of your neck, from shoulder to jaw. What you are feeling is not actually stretching of the muscle—there is no one muscle that runs from your shoulder to your ear—but stretching of the fascia surrounding and linking all the muscles between those two points. Medical understanding has lagged behind on this vital component of the body, but is finally catching up. The first Fascia Research Congress was held at Harvard in 2007 and started a tidal wave of research. 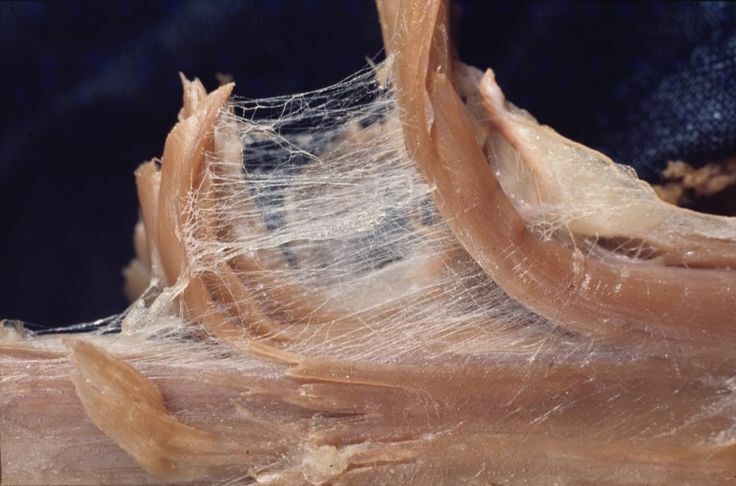 We know that fascia is a continuous network of web-like connective tissue that envelopes all our muscles. This network of connective tissue contains lots of pain-sensing nerves and is about as sensitive to pain as our skin. Fascia can also contract, or tighten, in response to “danger” signals from the brain. Fascia is the connective tissue “armor” of the body, tightening immediately in response to signals from the many nerves running throughout it. This provides strength in emergency situations and can be life-saving in the short-term. Researchers believe that a rapid contraction of the fascia is what creates the enormous extra strength that humans can produce in emergencies; for example, when a mother overpowers a mountain lion that is attacking her child, as happened recently in Colorado. In fibromyalgia we know that the brain is mistakenly triggering the danger or “fight-or-flight” alarm bells all the time, instead of only in emergencies. This occurs not in our thinking brain, but in those areas that control basic housekeeping functions like breathing and digestion. Sustained danger signals from the brain to the muscles results chronically tight muscles. As research advances, we are learning that the tightness lies not only in the muscles themselves but also in the fascia, that connective tissue casing that surrounds the muscles (think of the casing around a sausage that surrounds and contains the meat inside). And this sustained tightness of the fascia not only causes pain, it also generates inflammation, and contorts the muscles into painful knots called trigger points. If you want to dive more into the science supporting the role of fascia in fibromyalgia pain, you can read more in my article for Journal of Bodywork and Movement Therapy. Several studies have demonstrated the effectiveness of treatments that reduce tension and that can “unstick” painful knots in the muscles and surrounding fascia. The treatment that has helped me the most personally is a form of manual therapy called myofascial release (MFR), specifically the John F. Barnes Myofascial Release Approach. This technique involves a combination of sustained manual traction and prolonged gentle stretching of fascia and is by the far the most effective treatment I have found to unstick the fascia and reduce fibromyalgia pain. Two large European studies found that after 20 sessions of myofascial release, fibromyalgia subjects reported significant pain reduction. What is really great, though, is this provided more long-lasting pain relief, with most still reporting reduced pain levels one month after their last session. I recommend that my patients try at least two to three MFR sessions to determine if it will help them. It may temporarily cause increased muscle soreness, similar to what you feel after intense exercise. But after a day or two the muscle pain should be much better than it was prior to the session. If you find it helpful, I recommend going once or twice a week for about eight weeks, similar to a typical schedule for physical therapy. After that it can be done as needed for pain flares. Most therapists will also teach you techniques using balls or other tools that you can do at home to extend the benefit of each treatment. In addition to myofascial release, there are a few other manual therapies that can treat tense and painful fascia. Rolfing Structural Integration, or Rolfing™, is a manual therapy that approaches fascial treatment a little differently but can also be quite effective. A form of hands-on manipulation developed more than 50 years ago, Rolfing focuses on the fascia around the joints, with treatment emphasizing correcting posture and joint alignment in a series of 10–12 sessions. A related therapy is osteopathic manipulative treatment (OMT), a combination of gentle stretching and pressure on the muscles and joints. Since this treatment is performed by physicians (usually osteopathic physicians) it is often covered by insurance. Health care providers can also perform trigger point injections to break up the painful muscle knots. There are also several ways you can treat your own fascia. Learning these self-care tricks may be the most important step you take to manage your pain, and are a huge emphasis in my clinic’s treatment program. One way is to place a small, soft ball under any tight and painful areas of muscle. Allow yourself to sink onto the ball for a few minutes to provide the right amount of sustained pressure to allow the fascia to release. Finally, Yin yoga (also called restorative yoga) is a slow, gentle form of yoga that includes supported stretching using props such as pillows and bolsters to settle into a comfortable position for several minutes, allowing the fascia to melt and soften. Check out yin yoga classes or videos to learn and practice the poses. Understanding the contribution of fascia to fibromyalgia pain expands our treatment options. Certainly pain from the fascia is not the entire story of fibromyalgia pain—a hypersensitive nervous system that over-reacts to signals also needs to be addressed. But in my experience, tightness in the fascia is the spark that lights the pain fire and needs to be treated for really effective pain relief. To learn more about myofascial release and find a therapist in your area, visit myofascialrelease.com or mfrtherapists.com. You can also check out my clinic’s video that shows MFR in action. To learn more about Rolfing, or find a therapist in your area, www.rolf.org To find an osteopathic physician (DO) who performs OMT go to www.osteopathic.org. Would You Try Marijuana Gum for fibromyalgia and Chronic Pain?Good news for people suffering from fibromyalgia and other forms of chronic pain! Natural relief may soon be available via marijuana chewing gum. TWO NEW DRUGS FOR FIBROMYALGIA THAT ACTUALLY WORK. MUST READ ARTICLE TO RELIEVE PAIN. Hello! I know this is kinda off topic however , I’d figured I’d ask. Would you be interested in trading links or maybe guest writing a blog post or vice-versa? My site discusses a lot of the same topics as yours and I think we could greatly benefit from each other. If you might be interested feel free to send me an e-mail. I look forward to hearing from you! Terrific blog by the way!